MEET ALICIA. RADIO PERSONALITY. EMPOWERMENT MUSE. SNEAKHER STYLE AFICIONADO. OUR TORONTO CURLFRIEND. Within our CNK Chick Chat Series, it has always been important to connect the dots regarding how these boss babes inspire us. Whether it be through our passion for sneakHERs, style, or business - there is always a common thread that serves as a motivational tool for our audience. I was first drawn to Alicia 'ACE' West because of her fearless voice that she used to create a safe space for positivity. Alicia has utilized her positive platform to build her own brand and elevate her career in radio. She's a go-getter, a hustler, and a woman so driven in her goals - you can't help but feel empowered by her message. One thing I personally love about Alicia is her effortless style. 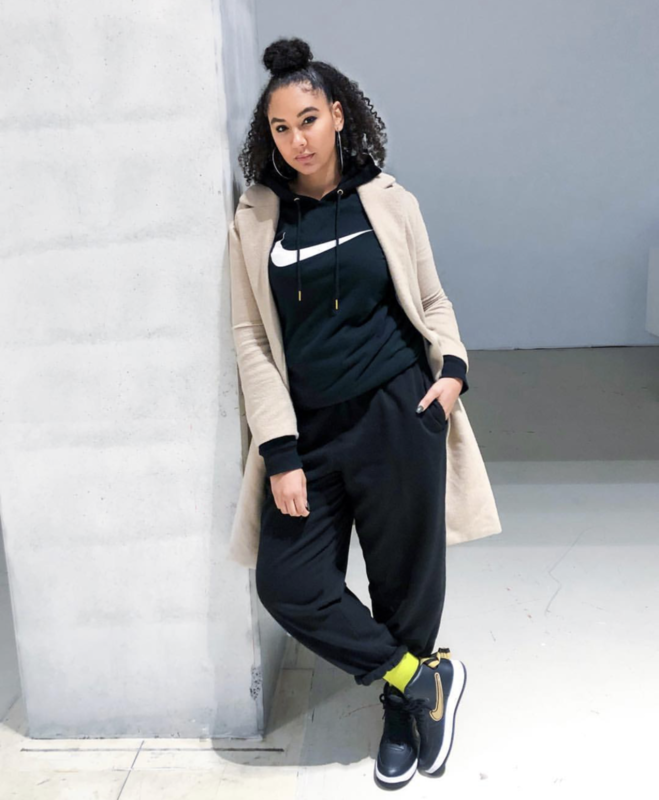 She gives off the cozy vibes, but at the same time lets you know that being your authentic self is very cool, even in just a hoody and kicks. Being able to vibe with everyday women who have pushed the limits of their surroundings is what we're all about. Sit back, kick up your feet, and check out our interview with Ace West. Pay attention as she dishes on coming up in the radio game, black girl magic, and her sneakHER rotation. STARTED FROM THE BOTTOM… THE 411. I am a radio personality in my home city, Toronto, for FLOW 93.5. I started my media journey back in 2012 when I did a post-grad program in radio. After completing it, I moved to DC to intern for WPGC 95.5 where I was the afternoon drive producer for 4 months. Being Canadian, I had to come back home after the internship..that’s when it got weird. I didn’t know exactly what I was supposed to do next so I started a blog that helped me get my first full time job in advertising. I worked in that industry for 2.5 years, until one day I was fired. It was November 2nd 2015, I remember that day like it was yesterday because it transformed my whole life. That day I decided I was going to bet on myself and promised I wouldn’t go back to work until I got a job in radio. So I formed #justaceit as motivation to not only go after my goals but ace them! The following summer I moved to New York because I got accepted into the WEEN Academy, which is a program for young women looking to work in entertainment. One of the co-founders knew my goal was to work in radio in the USA so after the program was complete, she connected me to a few women who she felt could get me there. 5 months later, I got my work visa and was headed to Detroit as the new online editor at Radio One. I spent almost 2 years there before my home city was calling me back but this time to live out my dream as a full-time on air personality! Just like the sneaker world, the radio world is a boys club but I’ve been blessed to work under two amazing, strong women who empower me to chase after my dreams. I think men are finally getting the picture that women make magic happen! But there’s still some who have a problem with letting go of the power. Radio is generally targeted at women, and yet men always think they know what women really want but let’s be honest, they don’t! So making sure my voice is heard when it’s predominantly males in a room is challenging yet a fight I am always up for. UNLOCKING HER BLACK GIRL MAGIC. We are needed. Especially women of color, especially black women. I think if we continue to unapologetically chase after our dreams and show the world our magic, we will have tables built for us. And always listen to that inner voice. Working in entertainment can have some people doing regrettable things to get into the door. Don't compromise your character for a quick opportunity because long term it will come back to bite you in the booty. #1 Be willing to hustle. It’s a fight to get in the door, and a bigger fight to stay in the room. #2 Tough skin is necessary. You WILL get told no or that you aren’t good enough more than once. If you don’t know how to bounce back, you’ll never make it. #3 Do your research. Study your craft. Know who the movers and shakers are. It’ll help you get into the door and help you move around the room knowing who’s who and who ultimately makes the decisions. I’m not good at this. It’s hard when your job revolves around staying up-to-date and relevant. I’ve been trying to shut my phone down earlier at night so I can unwind and I force myself to stay off in the morning until I’ve gotten the word and completely ready for work. I’m not going to lie, it’s extremely HARD! 90% of the time I start with the kicks. Once I’ve decided on which pair I want to wear. I’ll start thinking of the outfit. Usually (because it’s freezing out) I’ll pull out a hoodie or tracksuit. I keep it real simple and cozy in this weather and I’m not afraid to rock bright colors, regardless of the season. Toronto has a unique style. In my opinion, it’s a mix of New York and LA. I personally am a "cozy girl" as they call it. I grew up playing sports so a lot of my inspiration comes from the athletic world. I also draw inspiration from men’s clothing. It’s rare if I don’t have at least one piece of men’s clothing on. Jordan Master 12s are my go-to sneakers. They are SO comfy, and I can rock them with almost everything. Sesame Yeezy 350's, they’re easy to wear, the color is easy to match with. Just simple. And lastly the classic, all white AF1s low. You can NEVER go wrong with AF1s! BRANDS + GIRL POWER… WHO RUN THE WORLD? I think PUMA has the best collaborations with women. They are always finding dope girls to make some heat with. Toronto’s ILuvLola just made a girl power collection and they are so pretty! The only thing that saddens me is they don’t have extended sizes...yet. Jordan is doing big things for women. I absolutely LOVE that they have big sizes for big girls like me with just as big feet. I wear a size 11.5/12 in women’s so it’s nice to be able to find kicks that actually fit without having to squeeze my foot in. WHO CONTINUES TO INSPIRE YOU? The people. Whether I am planning my show or an upcoming event, I always think about the people who will be experiencing it. How will it be engaging? How can I make it a shareable moment on social media? Another way I get inspired is by talking to other people about their goals and purpose (that’s the Capricorn in me). I usually come up with some kind of idea through the conversation. ACE ON WHAT SNEAKHER CULTURE MEANS TO HER. Inclusivity. SneakHER culture shines light on us women and allows us to show off our style, our drip. It gives us a voice in a male saturated industry. If you want to check out more from Alicia West, go drop here a message on Instagram and check out her website HERE.